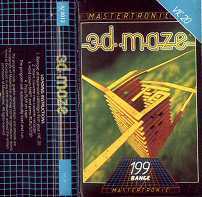 Mastertronic Limited began trading on 1 April 1984. Some of the titles might well have been on sale before this date but I have no information about this period. 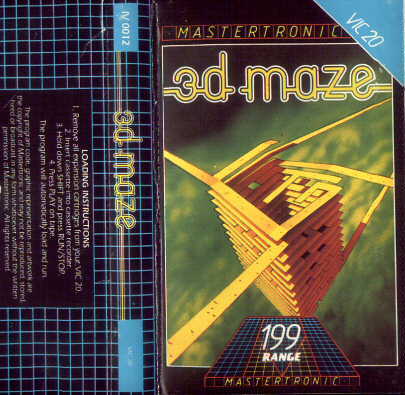 All the elements of the original Mastertronic cover can be seen in this example, 3D Maze published for the Vic 20 at Mastertronic's launch in April 1984. On a black background are superimposed the two company logos - the name strip at the top and the "M" at the base. Over the M is "199 range". Between the logos is the original artwork, commissioned for this game (probably painted by a firm called Words and Pictures Ltd, who did much of our artwork at this time). The blue colour flashes designate the type of computer. The instructions on the back are typically terse, just explaining how to load the game. More space is given to the copyright notice. Perhaps there was a "In a galaxy long ago" story printed on the reverse but probably not at this early stage. There are no screenshots, blurbs from reviews or references to any other products. 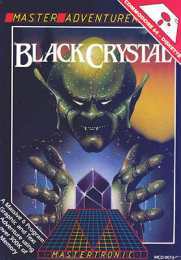 Adventure games were more in vogue then than in the later 1980s. The MasterAdventurer label tried to cash in but was a commercial failure. We tried to make these games look a little different - Black Crystal is typical. The corner flash shows that this version was a C64 disk, nearly all of which were sold in the USA. There is no "199 range" superimposed on the "M" logo because the �1.99 price point applied only in the UK. Incidentally Back Crystal was sold in the UK at £2.99 because it was a two-cassette package.